If you know me personally then you know that I have always enjoyed looking at how our Presidents became what they are today. It is really cool to sit in the Hall of Presidents and listen to some of them talk about our country. They do a great job of making these Presidents look real enough from where you are sitting. It will be interesting to see what happens to this exhibit over the course of the next few years. 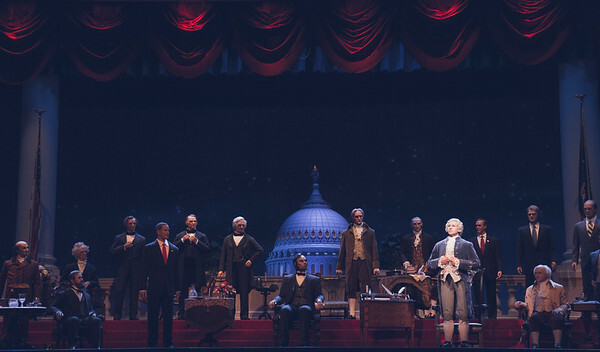 One thing about the Hall of Presidents at Disney is just how wide that it is. It is impossible to get it all in one picture without including too much of the nonsense around the stage. One way to get rid of that problem is by making a panoramic image. I stitched together five shots of the Presidents to make this one image. I think that I did a quick job of it in the moment and some of the Presidents are a little fuzzy, but some of them are a little fuzzy in real life so maybe that is not so bad.